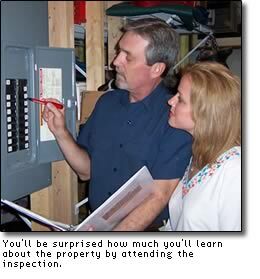 What to expect on the day of your home inspection. I'll begin by carefully taking a look at the exterior of the property. All exterior features of the property will be inspected including driveways, drainage systems, and fencing. The entire roof will be inspected along with chimneys, skylights, vent pipes and any other equipment mounted there. Next is the interior. I'll usually work through the building in a logical sequence, one room at a time and one floor at a time. All general wall and floor finish conditions will be noted throughout the building. Appliances and bath fixtures will all be tested as will all electrical and telephone outlets. If you requested a Septic System test, sufficient water will be run through the plumbing system to place a load on the septic tank and a dye will be added to the water. This will be done while the interior inspection is taking place. Finally, I'll perform any insect inspections, Radon, mold, or water quality testing you may have ordered. Then I'll prepare your report and discuss it with you. The entire inspection should take no longer than five hours. Most are less than four. However, situations vary with each property. After the inspection, I will print your summary report right on the Premises! No waiting for your summary report. We will go through the home and I'll point out the items that I found that need to be repaired or replaced, as well as the main disconnect for the elecrtic, and the main shut offs for the water and gas. This usually takes about 20 minuites. I Encourage You to Participate in the Inspection Process. It's a great opportunity to learn about your property and its important features. During the inspection, I'll be happy to answer any questions you have. You'll be surprised at what you'll learn and being present for the inspection will help you visulaize all the items in the report. But, not to worry, if you cannot attend the inspection, rest assured, the report you will receive is easy to understand and full of pictures, which makes it easy to follow. With a simple phone call, I can answer any questions you may have about the report.